This past Christmas, I was worried. Really worried... about a small gift I planned to stuff into Daughter's stocking. 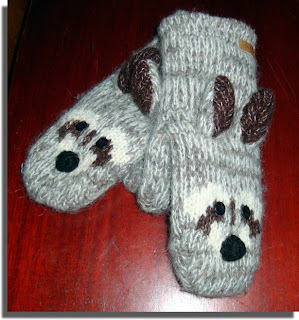 A pair of woollen mittens in the likeness of racoons. Yeah, you read that right. Racoons. With big ears, telltale "eye masks" and black pompom noses. By the way, my Daughter is 17. Not seven. I couldn't help myself; when I discovered them among other fleece-lined woollen cuties - green bulbous-eyed frogs, snakes with long braided tongues, brown monkeys, fuzzy teddy bears... well, I couldn't resist. But then I worried she would be crushed on Christmas morning, thinking I still considered her a child. I almost didn't give them to her. And I needn't have been concerned. She loves her racoon mitts and wears them constantly. I liked them too... so much in fact, that I wanted some to cover my very own cold hands. So after Christmas I treated myself to a set - but not racoons. Then a few days ago I acquired a second pair. This time some sad-eyed skunks (because you can never have too many mitts when you live in Winnipeg). It's easy to tell that these last ones are, in fact, skunks. Okay, easIER to tell when they aren't being smooched by a cat. But I couldn't figure out what the heck my first pair were... I thought they were cute with beady eyes and long floppy ears. But I had thrown out the tag that revealed what they were supposed to be. I finally DID discover what they are; but let me ask you. What do YOU think they look like? Oh, and if you're going to tease me about wearing kiddie mittens... well, in my defence, if they weren't meant for grownups, they wouldn't make them in adult sizes. I think they look like members of the canine family, so I'll go for a wolf. Or a coyote. As in Wiley. I love them and I bet your hands are really warm. I think I might agree on the doggie assessment, but it is an ambiguous dog at best. Perhaps they are just a little confused. I kinda see a rabbit there. I think they are bunnies! Cute bunnies! Kangaroos...it's all in the eyebrow thing. I want some!!! I love them!!!!! I was gonna go with the obvious "rabbit" design for the mystery pair. But then I thought outside the box and wondered if they are kangaroos. I see I'm not the only one to guess those 2 animals. 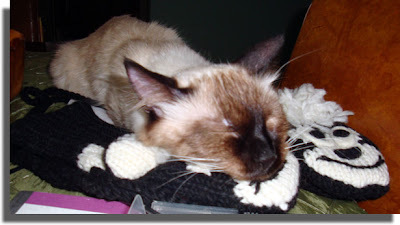 Way back in 1950 I used to watch a television program called, Time For Beany. One of the characters was a long-necked guy called Cecil the seasick sea serpent. Your socks remind me of a two headed Cecil the seasick sea serpent. I like the new format. Good job. Is there a right answer? I'll go with puppy dog. Cause they have cute widdo puppy dog eyes. The Finely Tuned Woman: Ah, yes, at first I thought it was a wolf too...Ha! Wiley Coyote! But then he would have a stick of TNT in his mouth... ;) They ARE really warm and even though they look silly, they are fun to wear. Anon: I thought rabbits too. Those ears ARE long... hmmm. Ed: AW.... otters! Now THOSE would be cute! Daisy: Oh, I wish they were! But sadly, no, they're not bunnies! Even WITH those floppy ears! I think they need to make some Daisy mitts! Now THAT would be cute! Jen: I know; the ridge is what really confused me. Cherie: Nope, not Kangas either, I'm afraid. Jo-Jo: Sorry. Both guesses are wrong.... even though I have to agree with you on both counts. It could be either! Swubird: Ha!!!! A seasick sea serpent!!! Maybe THAT's what those green snakes were!!! ;) Thanks for the compliment. Beth: Should I tell you???? Do I havta??? Jeff: "cute widdo puppy dog eyes"????? Ahahahahaha! I see Jeff needs some kiddy mitts too! What the Heck??? One ridge over the eyes DOES NOT a "Wrinkly Dog" make. GAH! I think I shall just pretend they are wolves. And when people cut me off while driving, I can make my wolves growl and sneer at them. Thanks for all your guesses! I loved hearing someone else's POV on this! I think they're probably meant to be rabbits, but their faces are too square. They actually look like dogs. OMG, those are SO CUTE! 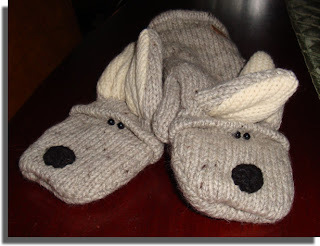 I think I like the raccoon ones best, but I would TOTALLY wear those and I'm 38. Okay, I'm back. Holy cow. I thought it was cold here. At that temperature, you can wear whatever you want on your hands!